Darn right I had one. Wanna make something of it? 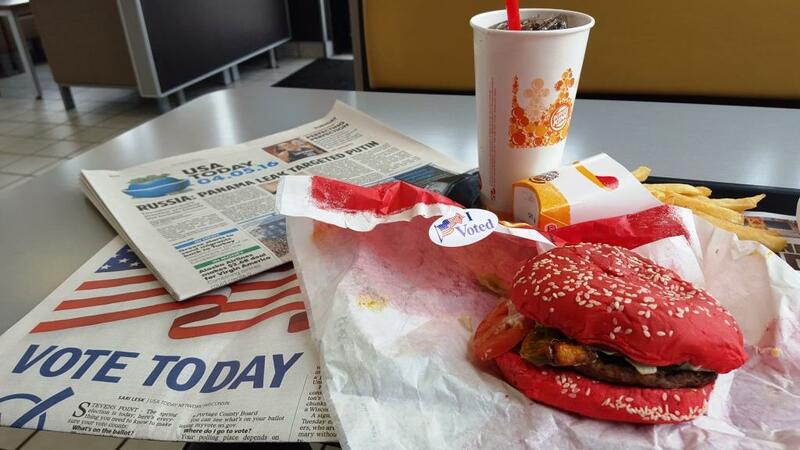 Stevens Point Still Life: Red bun, read paper, red state? Cheap marketing ploys don’t do much for me. The Angriest Whopper, however, is at least a little clever because it seems to tap into our collective psyche right now. Quick background: I went to the polls early today expecting a Bernie Sanders win, but with my mood tempered by an equal expectation that dark money would deliver the open Wisconsin Supreme Court seat to one of the most singularly unqualified candidates in the United States right now. A few hours at work didn’t exactly turn me into Mr. Twinkles. We’re in the midst of faculty searches to replace our departing droves. Other constant pains in the rear — such as our so-called governance structure at the university — make me question whether I should be bolting from here myself. I read the piece linked above and decided I could use a bad burger for lunch while reading more about the Panama Papers, which already have resulted in the resignation of Icelandic premier Segret Monibankss Monisson, or whatever his name was. 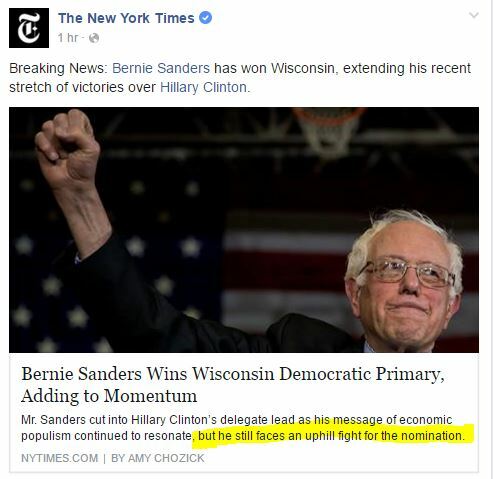 Yeah, Sanders won, but big deal. I’m still expecting the Democratic machinery to hand the nomination to a candidate who’s looking more and more like she could finish a comfortably distant second in the popular vote. Additionally, no matter what happens in the Republican convention, it won’t be any prettier than the end results of the last colored whopper, if you know what I mean. And despite early indicators of a happy ending for today’s Wisconsin Supreme Court race, later reports look more bleak. Regardless, I’m not hopeful for anything much better in the short run. I’m not seeing any serious discussion of the Sanders candidacy in mainstream media. Like the Black Whopper, it’s all “but … but … but …” (see screen shot at right). Little is being done about vote suppression. And how ’bout that U.S. Senate and its ongoing vacation from responsibility? My only consolation seems to be the chance to write bad puns and political exhortations directed at whoever has made it this far on this post. My anger is on auto-pilot, and I hope yours is too. Keep speaking out and making things happening. We have a long way to go.